Don't Blend in — Your Brand is Unique! Be the Vendor Everyone Remembers! It Takes Less Than 8 Seconds to Make an Impression! For warranty inquiries, contact us. Polyester flags are designed to last approximately 180 days based on daily use and care. Advertisement flags add additional layers of presence! The materials used to make our custom printed flags are superior. Get noticed from afar with this tall banner option! Check out Skyline custom backdrops! Custom backdrops create additional layers of awareness and are perfect for photo opportunities. Backdrops can be used as a standalone product or in addition to your custom canopy. Skyline offers attractive banners in all sizes! Banners make it easy to display information & branding, either standalone or hung on wall or fence. Banner setup is simple, and they look great in front of your shop or at a trade show booth. Use a banner to communicate your message at first glance! Our Lightweight 40mm or Premium 50mm Aluminum Hex-legged pop-up canopies are so easy & quick to set up. They provide dependable shade and shelter for athletic events, fairs/expos and other uses. They are also great for attracting attention at indoor events. Event displays create excitement and offer a creative way to share your brand with potential clients. Promote your business or event with a custom mobile podium or an iPad/tablet stand for digital sign-ins. Capture the crowd's attention with an awesome event display! Check out our specialty products for fun ways to share your brand and create recognition. Skyline Canopies offers a flag for every possible occasion — from group tours to table settings to golf flags and more! Custom trade show tablecloths allow you to show off your company logo at events and more. Attract people and attention, and create authority for your brand. Perfect for both indoor and outdoor events. Table covers are available as a throw, fitted or stretched cloth. We ordered a Skyline Canopy for our business and absolutely love it! It was a great investment since we attend a lot of local events. It adds a touch of professionalism having our business logo nice and visible on the canopy. And everyone is guaranteed to see it, which helps advertising at the events. We are looking forward to ordering more products from them. We are customers for life! I contacted Skyline Canopies because I knew they would get the job done right! I LOVE my feather flag and car flag. It was just what my open houses needed. If you are in Real Estate do not hesitate to reach out to them for any needs. They have it covered and their customer service is hands down the best! Thank you Sandra and Sean for always coming through!!!! We ordered a branded canopy for our business. 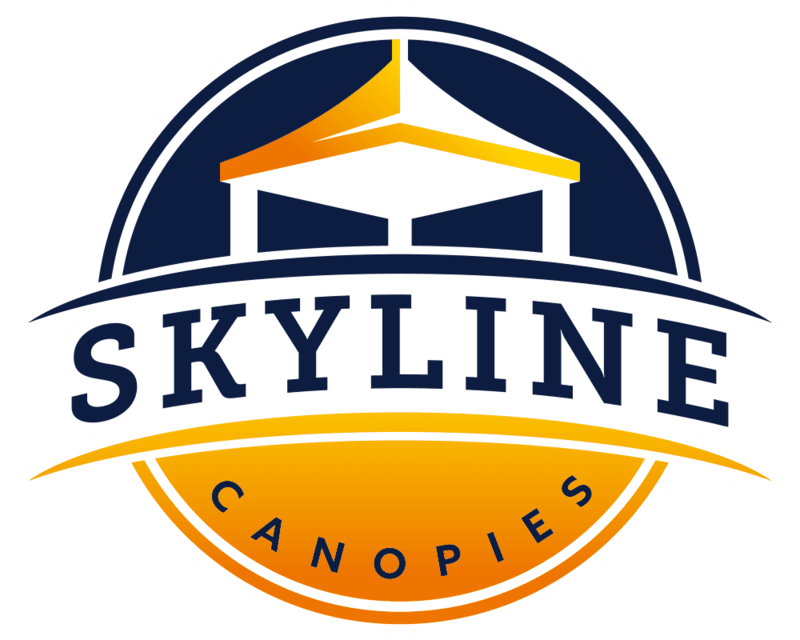 Skyline Canopies customer service was great and the quality of the canopy is outstanding. We will do business with them in the future and I would not hesitate to recommend them to anybody. We ordered several different products for our business, Sky Zone Space Coast, and every part of the process with Skyline Canopies was great! They were helpful through the selection process and very responsive during the design phase. They always give reasonable timelines for the products to be delivered and sometimes they deliver early! I can’t say enough good things about Skyline. They are great and you won’t regret working with them.